Viet, post: 11235973, member: 140273 Wrote: Interesting: while Kim met Trump, the rest of North Koreans toured around visiting many Vietnamese factories. Will we violate any sanctions if setting up factories in North Korea? As you see the visit to Halong Bay, the craddle of the Kinh people (người Kinh) or Jin people (京族), was under a less than auspicious hazy weather! Any hope of possible foreign investments resulting from a peace deal that did ultimately not materialized, are now short lived. China was first last year to woo the DPRK, a move that was later frustrated by the sanctions being not lifted by the U.S. This reminds one of those who tried to invest in Iran following the JCPOA, later loosing everything as the U.S. withdrew unilaterally from it. And this only exposes the extreme naivety of these players. No deal could have resulted from this summit. Indeed, North Korean media have stated on the eve of Kim Jong Un's departure for Vietnam, that the denuclearization of Japan, a de facto nuclear state, that has stockpiled 9 tonnes of Plutonium, enough for building 1,000 warheads, was a precondition for any North Korean disarmament deal. Could the U.S. have agreed to disarm the Japanese, having previously sponsored its nuclearization? Obviously, the summit was only meant to be a dog and pony show to fool the low IQs living in the U.S., and distract them from the build up of 5G/6G networks in their cities, instrumental in further deepenening the dystopian regime's repression of its own citizens. Pyongyang, February 23 (KCNA) -- Voices for the revision of the constitution and increased military spending and nuclear weaponization are heard from the conservative camp in Japan. This indicates that the Abe group can go nuclear anytime after giving up "three non-nuclear principles" and consequently, peace in the Asia-Pacific region will be exposed to a great danger, Rodong Sinmun Saturday says in a commentary. The commentary cites facts to prove that most Japanese rulers took much pain to realize nuclear ambition. Moreover, do not trust RUMINT that only relay the FAKENEWS. Check reliable sources. Trump said North Korea demanded the lifting of sanctions "in their entirety," which he could not accept. The North Koreans rebutted that, saying that Washington wanted more than the dismantlement of its key Yongbyon nuclear complex. North Korea has a stake in all Iranian affairs. And as we know, all strategic programs are jointly financed and developed, be it ballistic, nuclear, cybernetic and more. And this since the Iraq Imposed War on Iran. Tomorrow the meeting between our Marshal Kim Jong Un and Donald Trump begins in Hanoi. The end of the Korean War and the lifting of sanctions in exchange for nuclear non-proliferation will be the main axes of the talks. In a nutshell, the "nuclear non-proliferation" demanded by the U.S. side was to stop all North Korean joint developments with its all-weather ally Iran. And that was precisely beyond the DPRK's defined long standing red line. This includes the upcoming test launch of the Iranian-developed 100-tf thrust solid-fuel ICBM, from a North Korean missile base! ▲ 1. 9 Sept 2011 satellite imagery of the Shahid Modarres Garrison facility, solid motor static test firing site with no less than 8 horizontal static test stands in a row among others in the area that clearly show the burn mark obstructions from their gas jet firings (35°36'26.26"N 50°52'18.94"E), just before the November 12, 2011 explosion. Simulated ~40 meters Qaem SLV scaled to the ~90 meters ground burn mark from gas jet firings, according to the rocket to flame length 1:2 ratio. 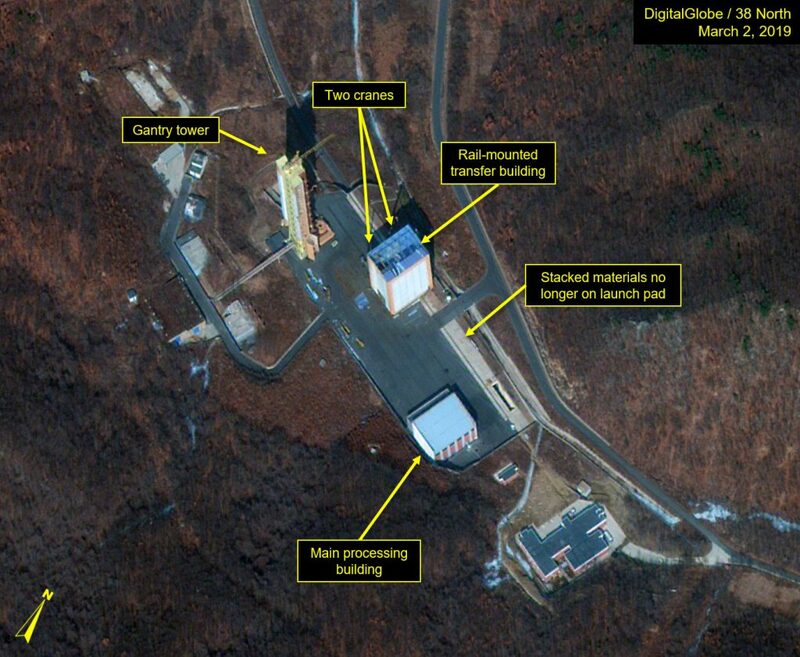 Commercial satellite imagery acquired on March 2, 2019, shows that North Korea is pursuing a rapid rebuilding of the rocket site at Sohae. This renewed activity, taken just two days after the inconclusive Hanoi summit between President Donald Trump and Chairman Kim Jong Un, may indicate North Korean plans to demonstrate resolve in the face of U.S. rejection of North Korea’s demands at the summit to lift five UN Security Council sanctions enacted in 2016-2017. Activity is evident at the vertical engine test stand and the launch pad’s rail-mounted rocket transfer structure. Significantly, the environmental shelters on the umbilical tower, which are normally closed, have been opened to show the launch pad. This facility had been dormant since August 2018, indicating the current activity is deliberate and purposeful. ▲ 4. Illustration of DPRK manned space launcher, published by internet fanboy. Also published on 5 March, a poetry video titled: "On the night of the landing". Like its all-weather ally Iran, North Korea is a most wealthy nation endowed by boundless natural ressources. All it needs is technology and investments to harvest these bounties. 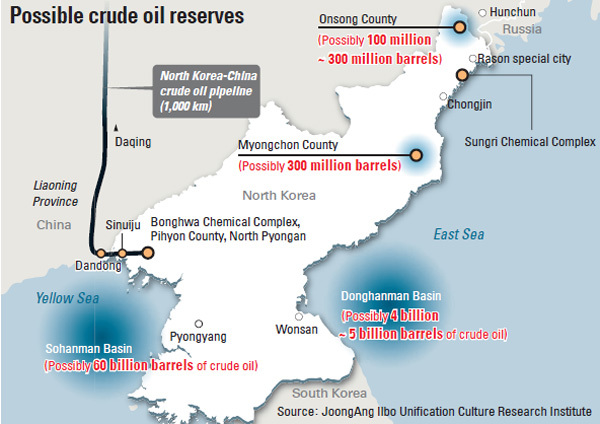 North Korea holds the eighth-largest crude oil reserves in the world, next to the United Arab Emirates. But oil is nothing compared to the largest known rare earth deposit in the world discovered in North Korea! ▲ 7. First world's reserve of Rare Earth Elements in the DPRK. From a most interesting flashforward seen in a video: the DPRK is indeed very wealthy, and will never bow before such little spoiled child U.S.! With only 1.4 millions tonnes of rare earth reserve left, how dare the impudent U.S. beggar overlook the DPRK's 216 millions tonnes! All they deserve is a good spanking! ▲ 8. Look at the badge(富): the DPRK is indeed very wealthy, and will never bow before such little spoiled child U.S.! Do not forget that the U.S. will continue its beggar bowl's world tour (Pyongyang, Beijing, Hanoi, Brazilia, Moscow, Pretoria, New Delhi), as long as it needs to import Rare Earth Elements (R.E.E. ), only to stay afloat in the A.I. race, having exhausted its own reserve of R.E.E during the cold war with the U.S.S.R.
▲ 9. The U.S. will continue its beggar bowl's world tour, as long as it needs to import Rare Earth Elements (R.E.E. ), only to stay afloat in the A.I. race. Even by securing all the world's remaining R.E.E. (120 millions tons), comprising China, Vietnam, Brazil, Russia and South Africa (VBRICS), the U.S. will still be outnumbered in term of supercomputers fielded and outgunned in term of supercomputers' performance. The U.S. is no match for North Korea's 216 millions tons. And time is running out, before its foreseeable inevitable final demise! Viet, post: 11238505, member: 140273 Wrote: You are from NK? Come on man, VN has considerable rare earth reserves but we can’t blackmail anyone. Either you are with the anti-imperialists, or you are with the imperialists. One can not be friend with both. It is a disgraceful sad reality that Rare Earth Exporting Countries (V.B.R.I.C.S.) even fail to organize themselves like the Arabs do with the O.P.E.C., in something such as an O.R.E.E.C. (Organization of the Rare Earth Exporting Countries). Even sadder to see that such an organization, unlike the O.P.E.C. that failed to defeat the West with its oil embargo in 1973, could provoke the effective collapse of the U.S. within months of such an embargo of R.E.E. exports. But we are not naive and don't even consider such a purely theorical hypothetical strategy, knowing perfectly well that Brazil, Russia, India, South Africa and Vietnam are all firmly supporting the West and the U.S. imperialism. As a consequence, the demise of the West will take years not months, and will be lead under the banner of the North Korea-Iranian banner only, in a prolonged cold war race for hightech and A.I. military dominance. The superseding Worl Order will be tripolar, defined by the three remaining Great Powers of the 21st century, namely North Korea, China and Iran. ▲ 10. The Three Great Powers of the Next World Order: Pole Position for the DPRK in the A.I. race, opening the dawn of the Pax Coreana.